The annual New York City Marathon runs through all five boroughs of New York City and is the largest marathon in the world. 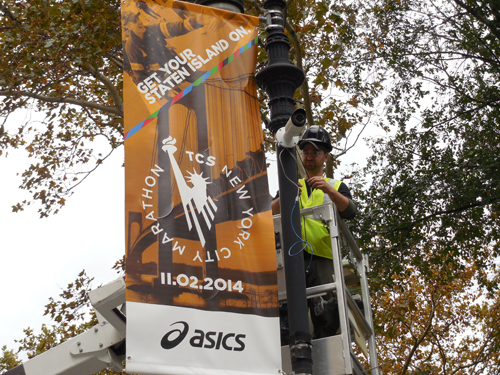 For the 2014 TCS New York City Marathon, organiser the New York Road Runners Club (NYRR) entrusted the supply of digital information transport services and a technology push package, to Virsig LLC. 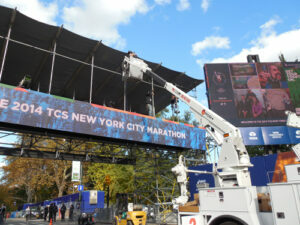 On the day of the marathon, the temporary system would be used to provide increased operational situational awareness, digital information transport for surveillance cameras, voice annunciators, media broadcast, and digital signage, including Jumbotron large-screen televisions. Due of the limitations of installing signal over long and costly fibre runs, Virsig opted to transport digital signals over coax cable. Allowing long cable runs to be readily deployed across the Marathon start at Fort Wadsworth, Staten Island, Virsig chose Transmission Bus (TBus) IP transmission technology from Network Video Technologies (NVT). Working in compliance under the National Park Service, US Park Police and the US Coast Guard Police authorities, NVT single and 4-channel TBus UTP/Ethernet over Coax transmitters, surveillance cameras, wireless nodes and antennas were installed in strategic light pole locations. The NYC Department of Transportation (DOT) worked with Virsig to keep the power supply to the poles energised at all times, to power the temporary equipment forming the 150Mbs Ethernet over Coax (EoC) transmission network. The IP network was installed using RG59 coax with spans of over 3,000ft (914m) across the open space at Fort Wadsworth. Ultimately, close to four miles of communication cable was installed from pole to pole, and over structures, fences and high up between trees. In the race command center (RCC), Virsig installed a wall of commercial grade monitors to be used as part of the primary camera viewing station. A Seneca viewing station was utilised to control tactical camera operations and Firetide Hotview Pro software was installed on the system to provide monitoring of the network via the marathon’s Smart Wall – which supplied up to 36 simultaneous camera views. TBus UTP/Ethernet over Coax transmitters and surveillance cameras were installed both on city streets and within Central Park. Above the finish line on a steel Photo Bridge Virsig positioned cameras and wireless nodes to record the race finish and capture the crossing of the finish line by every participant. Another camera was positioned at post-finish to observe the chokepoint – a sensitive area behind the race finish. Early on the Sunday morning of the race, over 50,000 competitors ran across the Verrazano-Narrows Bridge from Staten Island into Brooklyn, on the start of their 26.2 mile journey. A few hours later as large numbers of runners started to enter Central Park, the monitoring station in the RCC displayed dozens of cameras, which fed real-time data to the race staff and incident commanders – increasing overall situational awareness. In Staten Island, the Jumbotrons and systems that needed information transport worked fine. The near four miles of cable Virsig strung along with Network Video Technologies’ TBus Ethernet Transmitters operated flawlessly. The race went on until after dark, and while the last runners were wrapping up the course at Central Park, the Sony IPELA cameras still demonstrated bright clear images. And thankfully, while there weren’t any major anomalies or glitches at the race, if there would have been, the high-quality recorded camera video would have been available to the marathon’s management and law enforcement personal for evaluation of evidence. The massive IP networked technology solution was a success and for 2015’s marathon the same system will be used again but in an expanded format.